I can't let a day go by without expressing something. Every time the commercial comes on TV my little girls say, "Mommy! I want that for my birthday!" Call me old-fashioned, but I'm just not keen on the idea of putting the idea into a 3+ year old's head that she should be sporting tatoos. I think I'd rather have my kid run with a stick. What happened to the days of Pink 'n Pretty and Golden Dream Barbie? Oooo! and Barbie and the Rockers! I LOVED the neon spandex, leather mini skirts, big hair, and Ken's mullet. Everyday after school my best friend and I would walk home and play Barbies at my house. Here is a flash from my past. I LOVED this cassette. I don't know how many times I played this tape in my bubblegum pink cassette player. I don't recall any of the Rockers having tatoos. What was your favorite Barbie? 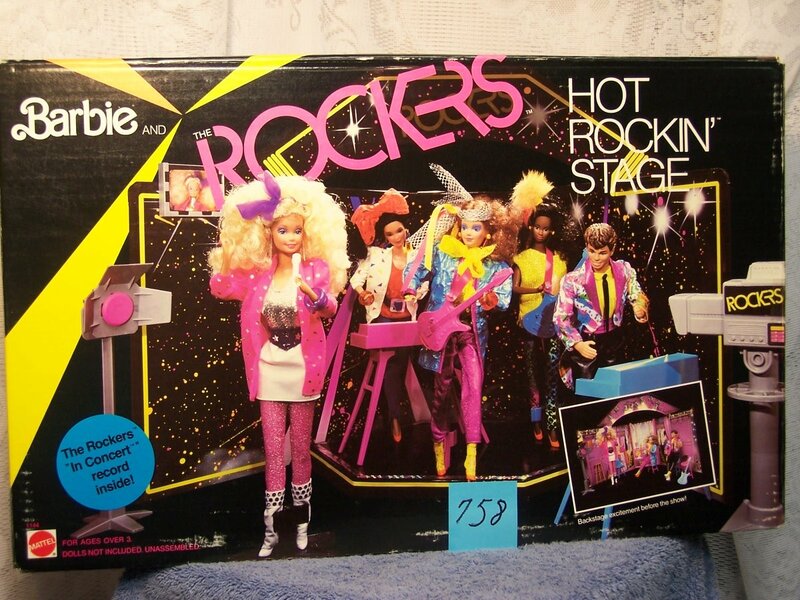 I had The SuperStar Stage Show where Barbie and Ken's ankles fit into a plastic thing and they glide around "the stage" while you play the Barbie record of famous waltzes in the back ground. Oh and my Shaun Cassidy record... sigh. None of my girls have been Barbie crazy like I was. So Sad. Joy - YOu must be smart. I could never figure out Lincoln Logs. My cabins never had doors or roofs. Carrie - Her name was Diva. I was so stoked to get the whole set AND stage for what I think might have been my 10th birthday. Derek was hot! Beth - That stage sounds cool! They should remake that Barbie and have her come with a CD or free MP3 download and call it Dancing with the Stars Barbie. I bet it would be a hit.